Are fish tacos intimidating to you? 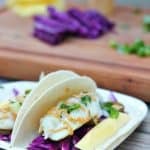 These fish tacos with corn salad and slaw will be the easiest meal you make this week and it’ll look like you slated for hours. With fresh ingredients and easy cooking fish tacos will become part of your regular weekly meal plan. I have to confess that this was my first time making fish tacos. I order them all the time when we go out to eat, but I never took the plunge and made them at home. This is largely due to the fact that I’m the only one that will eat fish in my house. Therefore, a recipe needs to be super simple in order for me to make it. 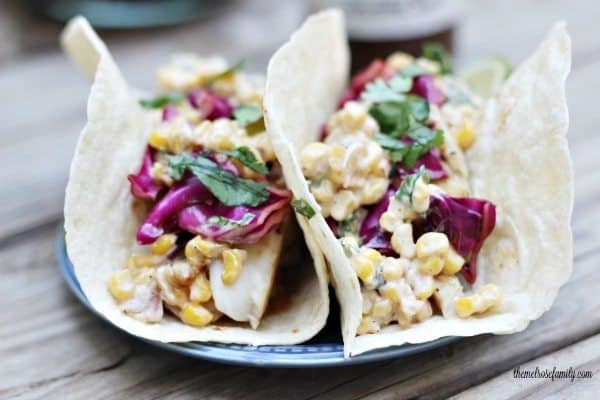 It doesn’t get much easier than these fish tacos with corn salad and slaw. 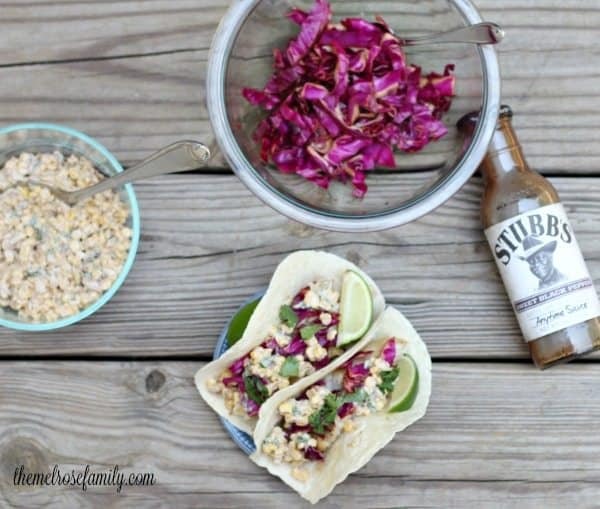 These fish tacos were so simple because of the Stubb’s Sweet Black Pepper Anytime Sauce. It was the perfect marinade for the haddock filets and it didn’t need to marinade all day long, which I especially loved. 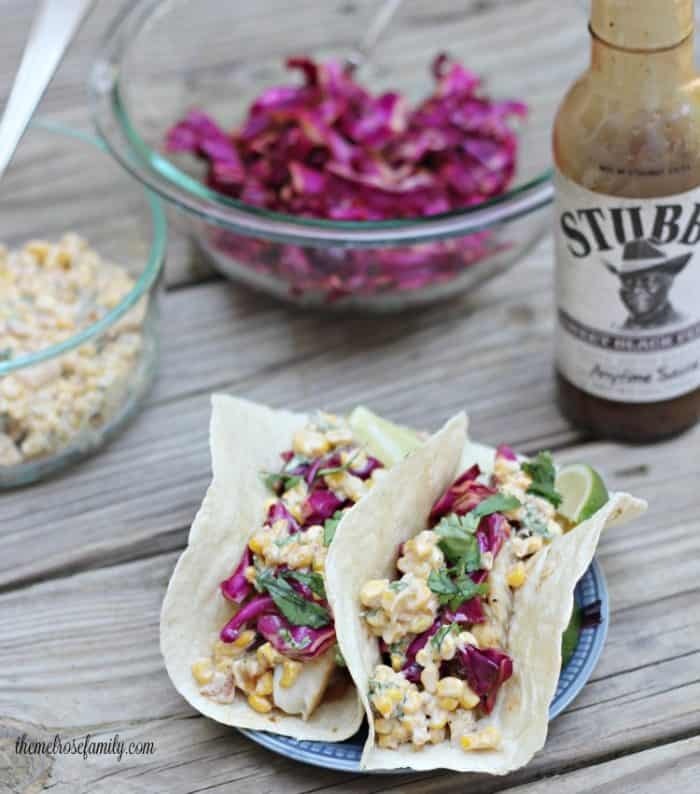 We are huge fans of Stubb’s Anytime Sauces because they are so easy to marinade or even top your favorite sandwich with. Plus, they’re made with real ingredients and the flavor in each is amazing. I’m particularly a huge fan of the Texas Sriracha Anytime Sauce, which I use on my wraps. A friend and I always have a tendency to clear off the shelves of it at our local grocery store. It’s just so good! After cooking the haddock filets in the Stubb’s Sweet Black Pepper Sauce, I topped it with my Mexican Street Corn Salad. We make our Mexican Street Corn Salad at least once a week. 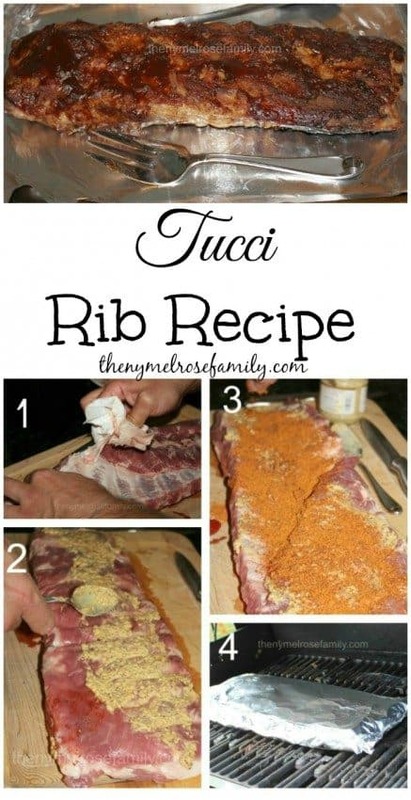 It is a favorite to go with our Tucci Rib Recipe, which uses Stubb’s Original BBQ Sauce. 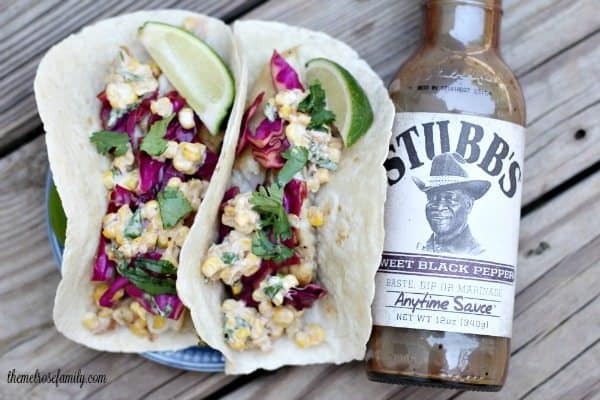 You can find other great ideas for using Stubb’s Sauce on Pinterest and Facebook . Love fish tacos, but you've never felt comfortable making them before These Fish Tacos with Corn Salad are the easiest fish tacos EVER! Prepare the corn salad by sautéing the diced onion and corn kernels from the ears of corn in a large pan until the corn is golden brown. Transfer the cooked corn to large mixing bowl and add in the mayonnaise, lime juice, chili powder and salt & pepper to taste. Store in the refrigerator and top with chopped cilantro and crumbled feta cheese just before serving. Prepare the slaw by combining the red cabbage, balsamic vinegar and lime juice in a large mixing bowl. Refrigerate before serving. For the fish, warm the pan over medium to high heat and cover the pan with Stubb's Sweet Black Pepper Anytime Sauce. Place the haddock filets face down with the skin on into the pan and cook for 4-5 minutes. Before flipping the filets with a spatula, place the Stubb's anytime sauce on top of the skin. Cook for another 4-5 minutes or until the fish flakes. Break the fish into bite size pieces. Place the pieces of fish into a flour tortilla and top with the corn salad and slaw. These look fabulous! We love fish tacos especially in the summertime! Fish tacos are one of my favorite meals ever and these just look so great! We have them in our home at least once a week and next time I make them, I’ll be trying this Stubbs sauce! I would have never thought of pairing fish and corn, but these sound (and look) amazing!